Washington Corrections Center for Women is a mixed custody prison located in Gig Harbor Washington. The prison opened in 1971 and houses a maximum of 738 female offenders of minimum, medium and close security levels. The facility is comprised of nine units; Medium security unit, closed custody unit, segregation unit, treatment and evaluation unit, close observation unit, J,K,and L units, and the receiving unit. Washington Corrections Center for Women offers vocational training in computer aided drafting (CAD), embroidery, and various construction trades. Furthermore, this facility offers adult basic education courses and GED testing to offenders. 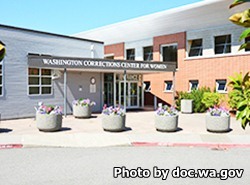 All inmates at Washington Corrections Center for Women are provided medical care, dental treatment and mental health services. Some offenders are assigned to community service crews that provide landscaping, harvest crops, work in the commissary, and conduct minor facility repairs. Volunteers have created multiple programs for inmates including creative writing, meditation, theater group, craft projects and substance abuse counseling. Washington Corrections Center for Women has a unique pet program that allows offenders to work grooming and training shelter dogs, who after completing training will be placed up for adoption.